What is a Silver Arrowman? Why should I become one? You may have heard the term Silver Arrowman before at an OA Weekend or Lodge Banquet, but you have never been quite sure about what it is or how you can become one. It’s actually a very simple program that is exclusive to Wagion Lodge 6. Any Lodge member can become a Silver Arrowman. 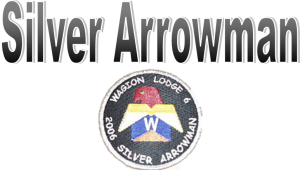 The Silver Arrowman Program is a program where here in the Lodge you can prepay for all of your weekends which includes the Banquet. The cost of the Silver Arrowman Program is $20 X 5 to cover the cost of the 4 weekends and the Banquet and then you pay your dues with this which is $20. The overall cost of this program is $120 (Conclave is not included in the Silver Arrowman Program). If you have already paid your dues then this sum will be subtracted from the cost of Silver Arrowman membership. Why should you do this instead of going and paying at each weekend? By becoming a Silver Arrowman you are automatically pre-registered for all OA Weekend that Lodge year so you never have to worry about calling the Council Office or pre-registering online. It makes registration at OA Weekends a breeze because all you have to do is go and sign in. You simply receive your wrist band and continue on setting up your tent or whatever else you are doing in preparation for the weekend. The other bonus of being a Silver Arrowman is that you get two very limited edition Silver Arrowman patches at no additional charge (these will only be distributed to Silver Arrowmen). Both patches are rounds and one is a pocket dangle so you can proudly wear it and show everyone that you are a Silver Arrowman and you can encourage all of your friends to be one too! Silver Arrowman membership can be done at the Banquet and only at the Banquet where one would pay their dues for the year. Also if you have been a Silver Arrowman in the past just a reminder that you must renew your Silver Arrowman membership for the new Lodge year in order to remain a Silver Arrowman. Be sure that you take advantage of this program in 2017!